This week was fairly good as photography goes, I took a lot of photographs, 311 of which I’ve downloaded, the remainder were from a wedding that I was helping my bother Andre out at. Choosing an image for this week’s deck proved more difficult than I would have thought, but that is mainly because the image I wanted to use, I decided to relegate to another blog-post for tomorrow. The image I eventually decided upon was chose for the unusual perspective, at least for me, I am usually more of an angular person when it comes to the direction from which I generally point the camera, Nikhil is usually the one who goes for “head-on” views. 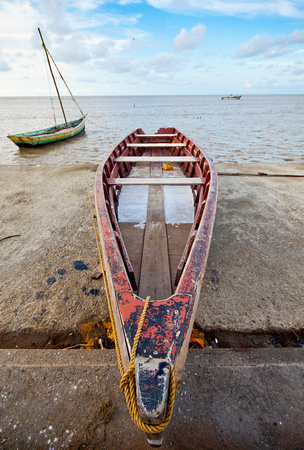 This was taken along the seawall somewhere between Montrose and Le Resouvenir on the East Coast of Demerara. Unusual perspectives are the best way I have found of telling the story I want to tell. Whether it is getting low, getting high (no pun intended 🙂 or getting close and using a wide angle, you have to be able to visualise what you want your viewers to see. Ooooooo Mike I LOVE your framing here, always good to take a different perspective, and good call on sticking with colour, too. Thanks Sarah, Definitely colour 🙂 I was never tempted to BW it, I was taken with the colour and texture of the boat in the foreground. In my eyes this works so well because the boats are not glossy modern ones, but ones which portray a life well sailed. Love your perspective. I really like this image Michael. i love the way the lines of the boat drag your eye up and down. I love wide too! I also love the perspective, Michael! It’s so compelling. Also love the use of three elements, as well as the beautiful sky. Well done! Thanks Michael, I like when people explain what in the shot they like or dislike, even I am very guilty of just saying “it’s nice”. Much appreciated. I love this head-on POV.The very first time I looked at this, what caught my eyes was just the boat frame as it kind of fills the frame. But upon closer look, I see the lovely blue skies and couple other boats nicely placed in this composition. I should say, very well done!